I don't know what season you are in. Me, I'm in the "nana" season of life. You may be young and single and still wondering what the future holds for you. You may be a young mama facing the isolation that only those who have lived through the infant and toddler years can relate to. or maybe the youngest of your flock just started college leaving you to face the empty nest. Me, I'm past all of that, and enjoying one of life's richest seasons, the "nana" years. Being a grandparent to our five grand babies is SO MUCH FUN! the one piece of advice I would give my younger self would be enjoy every season for what it is. Every season is God appointed. Every season has delights that are unique to that moment in time. 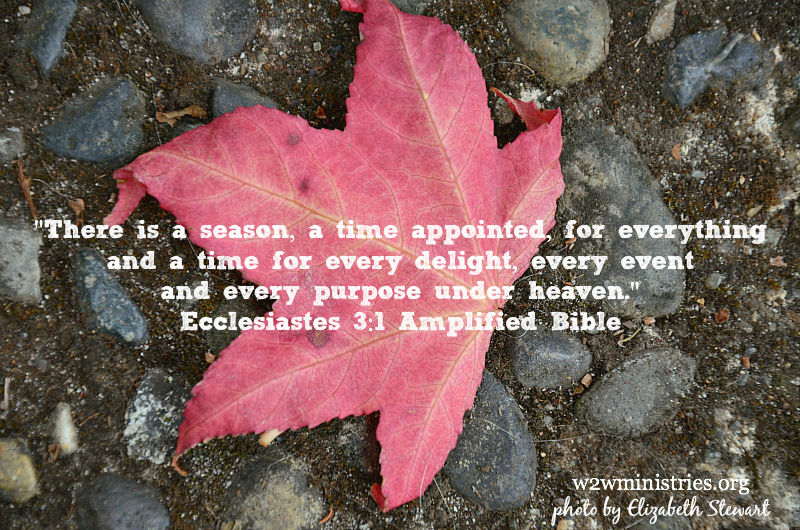 Every season has a God ordained purpose. It's our job to pay attention, seek God, and to find out what those are. not someday when the kids are out of the house or when you have more free time. I find that asking God to show me His will and purpose with a view far down the road can be both overwhelming and illusive. was to ask Him to show me His will for that day. brings it out of the realm of something illusive and difficult to grasp and into practical reality. Maybe it's as easy as starting each day with this prayer. Here I am today. I am Yours, bought with a price, with the priceless, precious blood of Your Son. Today, be glorified in me. Help me to walk in Your will and to fulfill Your purposes for this day. Open my eyes to see the delight you have in store for me today. Bring Your order and Your will into this day. Have Your way in all that I think, say and do today. Beautiful post with tons of encouragement for all of us in all walks of life at all times of life. Thank you, dear Elizabeth, for your devotion to God and the talents He has blessed you with to benefit the body of Christ. I am benefitted today! Learning to be grateful for the things that are, not the things that will be. Praying to glorify Him each day. It's a good prayer. Encouraging and inspiring post, Elizabeth! Thank you so much, June. You are a blessing! I do find each season to have it's own flavor. Like you I am loving the grandkids one. we just got back from a week with 4 of the grandkids and enjoying your part of the country. Flying over our beautiful country again today I was struck by the variety in what I could see until it was too dark. In this season I am ever aware as Diana Trautwein says, that the time I will be here on this earth is much less than what I already have spent here. Building into these precious lives is the priority of this season. and when you leave at the airport and a little 4 year old boy gets teary as he says, "I dont' want you to go Grandma." there isn't much else you'd rather do.